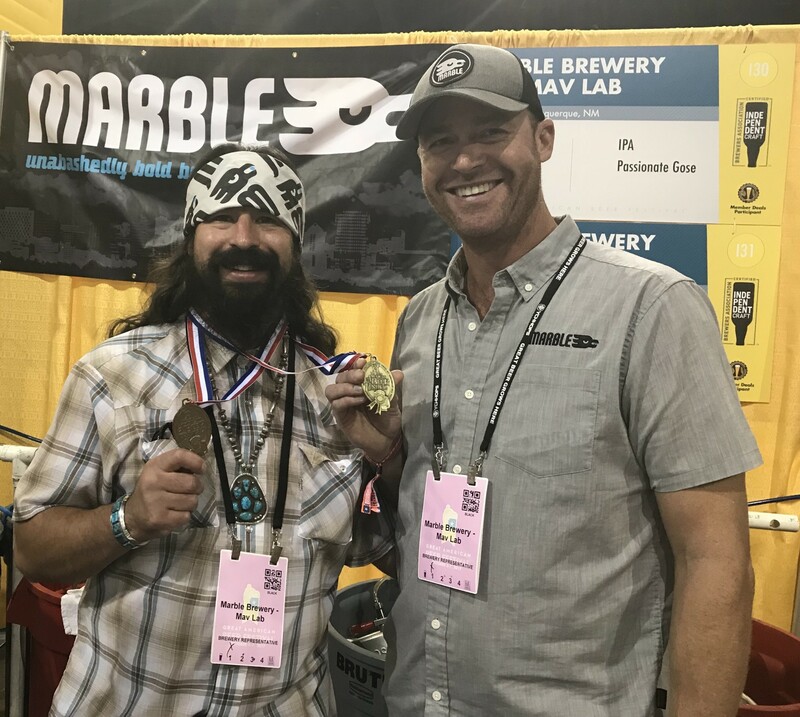 New Mexico brought home six GABF medals this year, and Arizona won four. Not a bad haul for such a thinly populated part of the Southwest. Kaylynn McNight, head brewer at the Nexus Brewery, is ecstatic over her gold medal for Imperial Cream Ale. This makes three medals in four years for the beer, which won a GABF silver in 2015 and a WBC gold in 2016. The Imperial Cream Ale is a big seller for Nexus, second only to its Chamomile Wheat, which won a GABF silver in 2015 and a WBC gold in 2016. Weber started by adjusting the recipe from feedback at festivals and then won gold at the 2017 World Beer Championships. “The feedback from them [at Tastings.com] has been valuable, with good descriptors and honest assessments,” Weber said. Rod Tweet of Santa Fe’s Second Street Brewery modified the recipe of his 2013 GABF gold medal–winner just a bit for this year’s winning recipe. Rod’s Steam Bitter was created when he added a lager yeast to his best bitter recipe. This year, he trimmed the IBUs slightly, used a drier lager strain and fermented at 62 degrees to win bronze in the Amber Lager category. Saddle Mountain Brewing of Goodyear, Ariz., won a gold medal for Taildragger Clan Destin. “This is the greatest honor we could possibly have hoped for,” said owner Jacob Hansen. “Brewmaster Neal Huttenhow deserves all credit for such a fantastic Scottish-style ale.” Clan Destin is a classic dark, chestnut brown, malty Scottish export ale. It should be noted that, according to Saddle Mountain’s Laura Hansen, the award-winning beer was produced with water from the AZ Pure Water Brew Truck. After purification with ultrafiltration and reverse osmosis, the water is exposed to high-intensity UV light and hydrogen peroxide to disinfect it and destroy remaining organic compounds. Perhaps the proof of the water’s purity is the GABF gold medal. Scottsdale’s Goldwater Brewing brought home a bronze for Machine Gun Teddy, an American-style brown ale brewed with caramel, chocolate and Victory malts. Machine Gun Teddy is named after the building’s mascot; downstairs used to be an indoor shooting range, and it now houses the Goldmine, where lagers as well as barrel-aged and rare beers are stored and served. Tempe’s Pedal Haus Brewery won silver for its Pedal Haus Light Lager, a low-calorie and gluten-reduced beer weighing in at 3.5% abv and 10 IBUs. Texas can boast both the Mid-Size Brewing Company of the Year and Large Brewpub of the Year in Houston’s Saint Arnold Brewing and Austin Beer Garden Brewing, respectively, along with 21 GABF medals. Look for more on these Texas breweries and others in the pages of the Celebrator this spring. It’s a good time to drink beer in the Southwest! Mel Pearson is an award-winning homebrewer and veteran beer writer who loves to drink locally brewed beer. If you have any suggestions, questions or comments, you can contact him at swbeerguy@gmail.com.